From W. Bruce Cameron, the author of the New York Times and USA Today bestselling novel A Dog's Purpose, which is now a major motion picture! 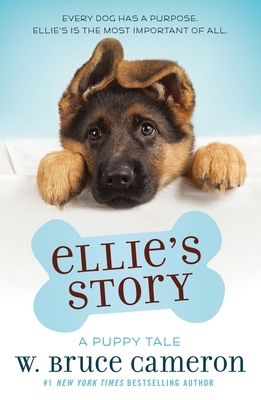 Ellie's Story is a heartwarming illustrated novel adapted for young readers from the beloved and New York Times bestselling A Dog's Purpose by W. Bruce Cameron. Ellie is a very special dog with a very important purpose. From puppyhood, Ellie has been trained as a search-and-rescue dog. She can track down a lost child in a forest or an injured victim under a fallen building. She finds people. She saves them. It's what she was meant to do. But Ellie must do more. Her handlers—widowed Jakob, lonely Maya—need her too. People can be lost in many ways, and to do the job she was born to do, Ellie needs to find a way to save the people she loves best. Ellie's Story is an inspiring tale for young animal lovers. Adorable black-and-white illustrations by Richard Cowdrey bring Ellie and her world to life. A discussion and activity guide at the end of the book will help promote family and classroom discussions about Ellie's Story and the insights it provides about humankind's best friends. W. BRUCE CAMERON is the #1 New York Times and USA Today bestselling author of A Dog's Purpose, A Dog's Way Home, and A Dog's Journey (all now major motion pictures), The Dog Master, the A Dog's Purpose Puppy Tales for young readers (starting with Ellie's Story and Bailey's Story), The Dogs of Christmas, The Midnight Plan of the Repo Man, and others. He lives in California.